The Red Sox clinched a playoff spot on Sept. 19 after a win against the Orioles. The playoff berth comes one year after a mediocre performance by the Red Sox in the 2012 season. They finished 69-93 — a complete flip of this year’s record. What is the difference between the two seasons? I see two: the managerial change and beards. Lots of beards. Last September, when the Red Sox management fired Bobby Valentine, I threw a party. For one, I was still bitter that Terry Francona had called it quits on the Red Sox. I couldn’t think of anyone better to lead the team. Then, Bobby V was announced as skip. People tried to convince me that he would lead the team to success. Ahem, 69-93? No. Although a year isn’t a good indicator of what a manager can do with a team, I will never believe Valentine was a good fit for the Sox clubhouse. Thankfully, the Red Sox hired former pitching coach, John Farrell. I had a strong feeling that the Red Sox needed Farrell; it’d only be a matter of time before the Sox would start winning again. Most importantly, the Red Sox needed a serious attitude adjustment. The 2013 Red Sox possess the child-like essence that was missing the past few years. Francona’s final (and controversial) season lacked the quirky-ness the team had in years before. The Valentine-era reeked of tension and distrust. He called out his own players, which created problems. Along with Farrell, the Red Sox added players to their roster who fit the clubhouse mould. Ben Cherington (thankfully) did a good job of adding veteran guys to the roster. Enter Mike Napoli, Jonny Gomes, Shane Victorino and Ryan Dempster. The Idiot-esque beards returned. And thankfully, so did the wins. The Red Sox had the best record through the first month of baseball. This success continued for most of the season. I turned on a Red Sox game expecting a win. Now, they’ve entered the playoffs. The next thing on their checklist? Winning the American League East. The Red Sox beards set the team apart from any other in the league. The personalities of the players in the clubhouse make them fun to watch. (Photo from Jim Davis of Boston Globe). 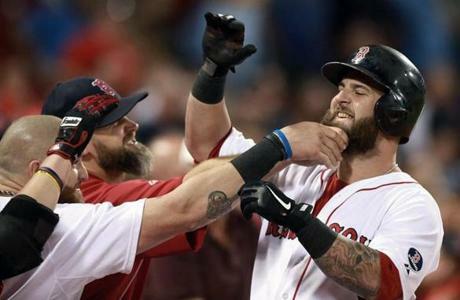 After a spirit night like “Dollar Beard Night,” I think it’s apparent the Red Sox separated themselves from the pack. Think about 2004. A team of oddballs. Who would’ve thought they’d kill the curse. This year, I’m hoping for no different. Who cares if George Steinbrenner wouldn’t approve?